YAY! My 1940's sailor dress is complete and I love it!! This is based on McCall 4114 (check back tomorrow for the giveaway). I made it up in a bright blue linen with white velvet trim. The dress features a traditional 'sailor' top collar and gathers in the bodice front and back and the skirt front. This was my first time making a gather stay for the skirt--really helpful to prevent it from stretching! I used three adorable buttons that were part of a vintage pound of buttons gift from Sofia (best gift EVER). They are really beautiful and are the perfect colour! The trim on the sailor collar is done before the collar is faced and applied to the bodice. Thank goodness!! 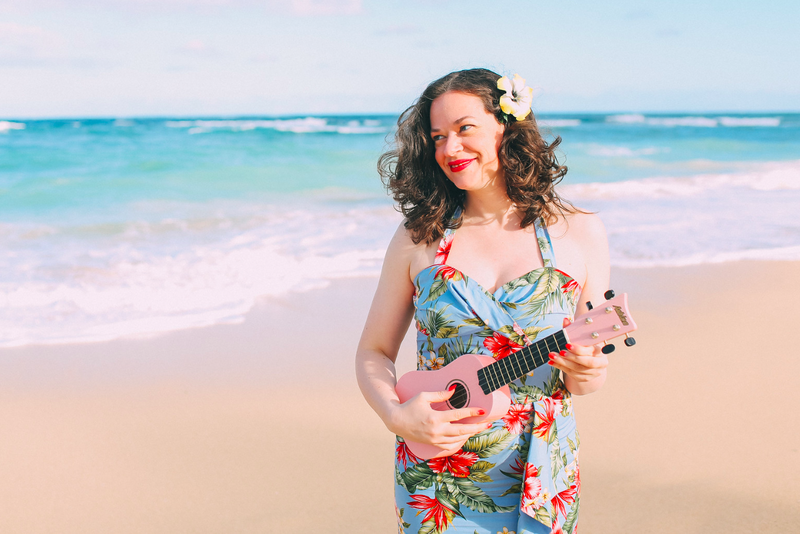 I am really proud of my trim--and there were no major mishaps! I made the belt out of the matching fabric using a belt kit from A Fashionable Stitch. These kits are great because it includes the flexible belt backing (that you can sew through) but also a buckle with instructions on self covering. I always omit the prongs (I prefer slide belts--and these are very secure). We also wanted to take some pictures by the Royal Yacht Brittania (in the background)--a royal residence. We managed to get near the water before we were escorted out by two security guards. Ah, well. We'll have to go back when they are open! Hence the big fence in the pictures! The dress also features faux pockets with white topstitching. It's actually topstitching over a pleat! Such an interesting detail. I just love the way the lights play on the water at that time of night! So enchanting! I like this dress more than I thought I would. I have a feeling I'll be wearing it A LOT this summer. It's such a fun 40's style. What do you think? 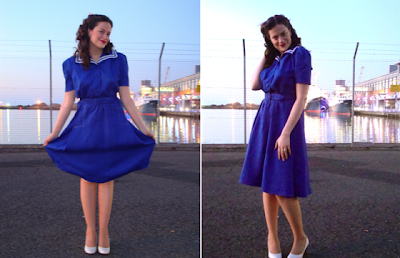 Would you ever wear a 40's style sailor dress? I just love it! So charming! It's really the perfect sailor dress! i love love LOVE it! the color is great & it is delightfully sailor-y (is that a word? it is now) without looking like a costume. fantastic job! This is absolutely gorgeous!! 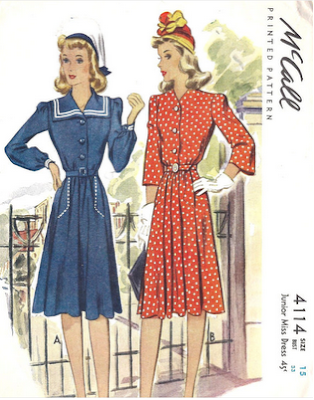 I'm always on the lookout for the perfect sailor dress pattern, but have yet to find one. It is very pretty. I like the way you take so much care with your sewing. I'm not really into vintage, but I am sure I would wear something like this. So adorable and what a great color on you!!! Oh Debi, your dress is beautiful. I have always had a penchant for nautical themes. Even this is a vintage style it looks just as current now. Dusk is and has always been my favorite time of day, the light is almost magical. What a beautiful dress! It looks lovely on you. I can see why you love it. It looks amazing on you. So good that if I ever saw you, I might try to steal it! It's lovely. The colour is perfect and those buttons are gorgeous. I'm obsessed with sailor dresses. Oh I love it, it looks fabulous! I can't believe your trim, so perfect. Great pictures, what a gorgeous sunset. Fabulous dress! Fabulous colour! How good does this dress look! The buttons are a perfect match and very pretty. I know you are very happily married, but I want Richard Gere in his navy uniform to sweep you up in his arms RIGHT NOW. Fabulous dress and shots! Love it - such a lovely dress and blue is my fav colour :) too. OMG! Sooooo cute! In the photos back, you look like a schoolgirl funny turn of the century, it is so beautiful! I really love this dress! I agree with you ... it's a shame that we're so far, it would be fun to escape to a sewing retreat for one day each week, that would be great! That is an adorable dress and you look so pretty in it! Also, I like your hair. Such a cute dress. I love the top stitching detail. I think it turned out looking even better then the illustration on the pattern envelope. Well done! Very pretty dress! Especially like the twirling! The colour really suits you. Beautiful dress. 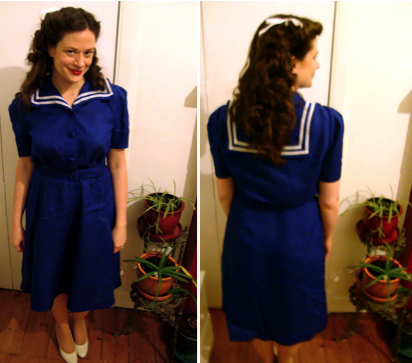 I love the vintage nautical style - fun and flattering - you look wonderful in it! AWESOME JOB! I really like the sailor style dresses this year - though I haven't tried one. You did a wonderful job and the dress looks great on you! I adore this! You look great as always.